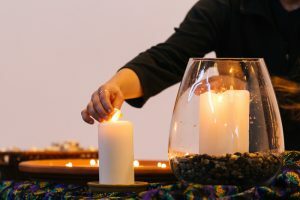 Seven candles were lit at an April 29 memorial service in Martin Chapel at Eastern Mennonite University—one for Michael Jesse “M.J.” Sharp ’05 and one for each of his colleagues, some like Sharp confirmed dead, others still missing, in the Kasai-Central province area of the Democratic Republic of the Congo. Sharp was on a U.N. mission when he was kidnapped March 12, 2017. He was collecting information about the use of child soldiers and massacres of unarmed civilians. The group also sought dialogue– as Sharp had in his previous position as Eastern Congo Coordinator for Mennonite Central Committee– with stakeholders to promote peaceful solutions to country’s long conflict. The information would help the UN Group of Experts on the Congo advise the U.N. Security Council. EMU will honor Sharp, his commitment to peacemaking and his life of service with a special recognition during the 2017 Homecoming and Family Weekend. See all 2017 Homecoming and Family Weekend events. “M.J. was remembered for his sharp wit, keen mind, restless spirit, tenacious belief in nonviolent means for resolving conflict, and for following Jesus in being fully with the people with whom he was living or visiting,” said Brian Martin Burkholder, EMU campus pastor. Burkholder attended Sharp’s memorial service in Hesston, Kansas, in mid-April and facilitated the campus service during Commencement weekend. A candlelighting ceremony at the April memorial service commemorated Sharp and his colleagues. She noted the tension in his life — and in all of our lives — “between where you want to be and where you need to be,” between a calling and the risks of that calling. After graduating with a degree in history and a minor in German, Sharp worked for three years with the Military Counseling Network in Germany. He then earned an MA in peace studies and conflict resolution at Philipps-Universität Marburg in Germany. From 2012 to 2015, he worked for MCC in the Congo, and became a contract employee as an Armed Group Expert for the UN later that year. His home in North America was in Albuquerque, New Mexico. He is survived by parents John and Michele Sharp, and two sisters.